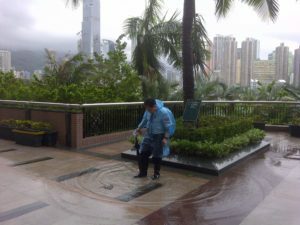 Every year there are a few tropical typhoons passing by Hong Kong, so it is a kind of special routine for the locals living in the city, that happens only once in a while. There are many typhoon warnings, but after signal 8 the city freezes. 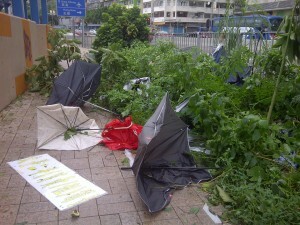 This time Typhoon Vicente was the strongest to hit Hong Kong in 13 years, and also my first typhoon experience, signal 10. Apart from the excitement in the previous hours, the strong winds and rain, the broken trees and umbrellas and the empty streets, what really stroke me is how can an event like this reflect so well Hong Kong society. First of all, people in Hong Kong are trained to obey, the Hong Kong observatory decides when a signal is issued and they run home. Observatory decides to resume business (normally in a convenient time for the stock exchange) and people go back to work. A few minutes earlier the streets will be empty, but then all of a sudden public transport floods. After living here for a while, I have the feeling that people in Hong Kong work long hours, but not necessarily enjoying the job they do, and they tend to have a limited amount of holidays. 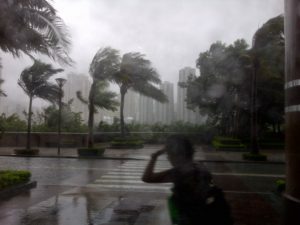 Therefore, a typhoon signal 8 is music to their ears, a very good opportunity to stay off work, so many people are praying for the Typhoon to be more intense, as it brings with it more hours of home entertainment. Another typical feature is how reserved local people are to foreigners. They will very seldom start a conversation, or smile when they see you, some people even try to avoid eye contact. But an event like a typhoon makes them want to explain the foreigner which is the procedure to follow, share their typhoon stories and warn the vulnerable white guy against the danger, so they become more talkative. And they smile, and they look at you. Briefly, at least until the typhoon is gone. The last surprising thing for me has to do with food. In Hong Kong real state is very expensive, so people tend to live in small places. Kitchens are small and restaurants are good and cheap, so many people eat out on a regular basis. There are opportunities to have a big variety of food in the city since very early in the morning until late at night. After the typhoon a work colleague came to talk to me, she seemed preoccupied. She talked to me just a couple of times before, but now she was very worried about where I had dinner the night of the typhoon. How could I survive with all restaurants being closed? Did I starve? When I told her that I cooked my own dinner she put an expression of incredulity and walked away. If it was for her, we would probably talk again when next typhoon comes to Hong Kong. In the meantime, she will be working, eating and praying.